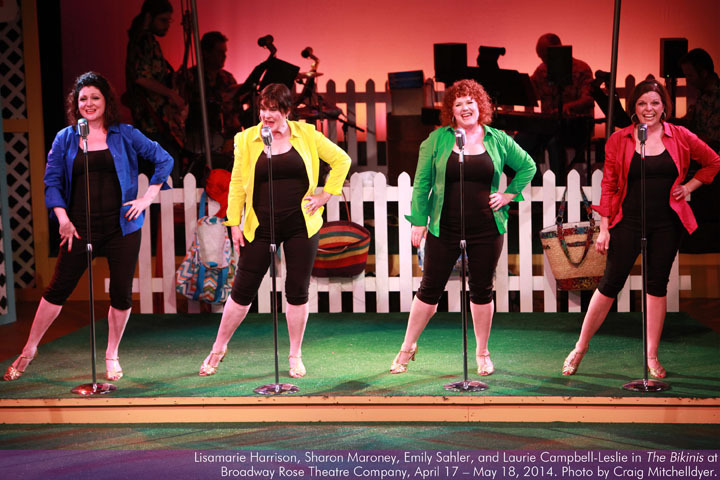 Hit ‘60s girl group The Bikinis thought they’d long since hung up their two-pieces to dry, but a charity benefit brings them out of retirement for one last performance. True Jersey girls at heart, the buoyant quartet lights up their hometown boardwalk with bouncy, summery tunes such as “It’s In His Kiss,” “Yellow Polka Dot Bikini,” “Heat Wave,” “Under The Boardwalk,” “These Boots Are Made For Walkin’,” and “It’s Raining Men” – all to raise money for the good folks at Sandy Shores Mobile Home Beach Resort. Laurie Campbell-Leslie (Annie) was most recently seen as John/Judas in Godspell with Pacific Stageworks. 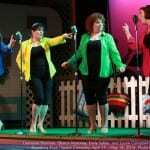 Other favorite shows include The Great American Trailer Park Musical (Linoleum), Hello, Dolly! (Dolly), I Do! I Do! 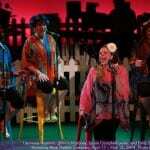 (Agnes), Gypsy (Mama Rose), Sweeney Todd (Mrs. Lovett), The Music Man (Marian), Bark! 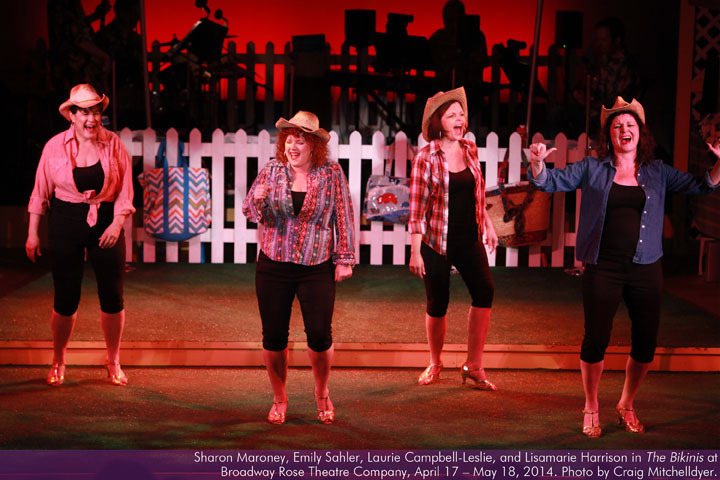 (Zola), 1776 (Abagail Adams), The Sound of Music (Maria), My Fair Lady (Eliza), Click Clack Moo, Cows That Type – series (Cow & Pig), A Little Night Music (Desiree), Man of La Mancha (Antonia, Portland Opera) and Forbidden Broadway (triangle productions!). Laurie is a native of California where she met her husband of 25 years. They make their home in Vancouver with their extraordinary children and puppy, Puka. 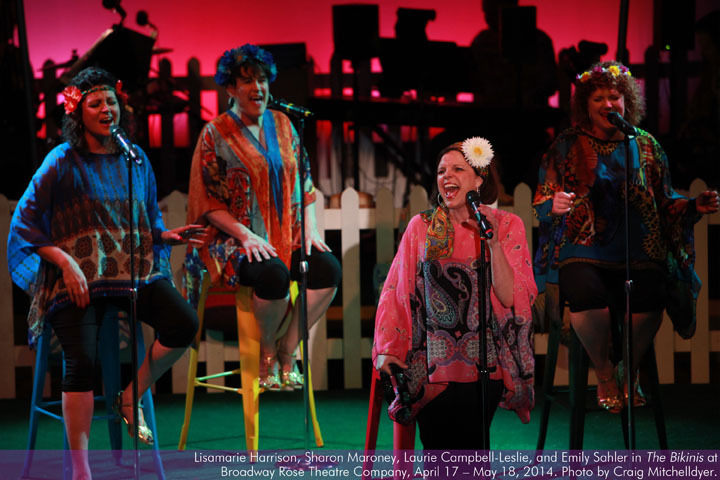 Laurie is as happy as a yellow polka dot to be making her Broadway Rose debut in The Bikinis with an incredible cast of powerhouse, fun women and a rockin’ band. She’s doubly happy that she’s not wearing a bikini in the show! 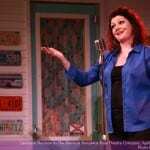 Lisamarie Harrison (Jodi) is an actress and choreographer with over 30 years of experience on the Portland stage. 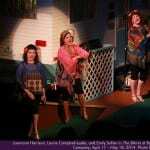 On-stage roles: Violet in 9 to 5 The Musical, Betty in The Great American Trailer Park Musical, Rhetta Cupp in Pump Boys & Dinettes, Sue Ellen in Honky Tonk Angels (2011 PAMTA award Best Actress), LaVerne Andrews in Sisters of Swing and Christmas of Swing, Sister Hubert in Nunsense, Laura in Recognition, Mazeppa in Gypsy, Lottie in Mack & Mabel, Gabrielle in The Dinner Party, Barbarette Blade in Wild Space A Go Go, Elizabeth in El Grito del Bronx, Alcandre in The Illusion, Kate in The Wild Party, Woman 1 in Putting It Together, Mae in Reefer Madness! The Musical, and Rizzo in Grease. Principal film and television credits: Leverage, Frank Stone, The Light, Front Seat Chronicles, Mock Trials, Future Perfect. Choreography: RENT, Christmas on Broadway, The Sound of Music, Pirates of Penzance, and The 25th Annual Putman County Spelling Bee. 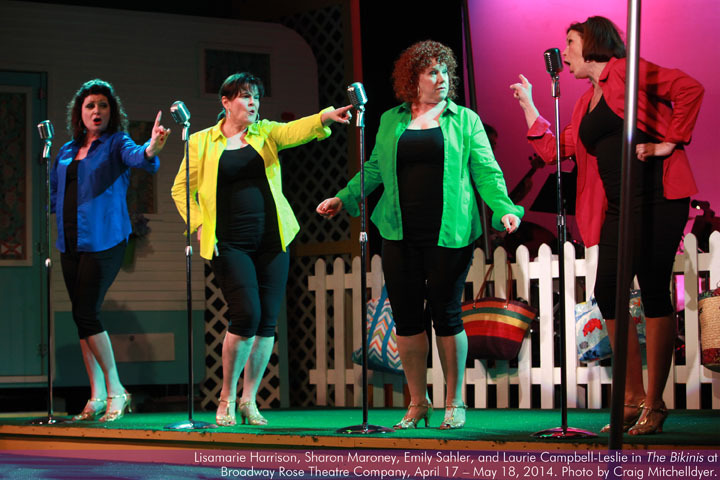 Sharon Maroney (Karla) Co-founder and Producing Artistic Director of Broadway Rose Theatre Company, Sharon was last seen as Louise in Always…Patsy Cline and before that Prudie in Pump Boys and Dinettes. 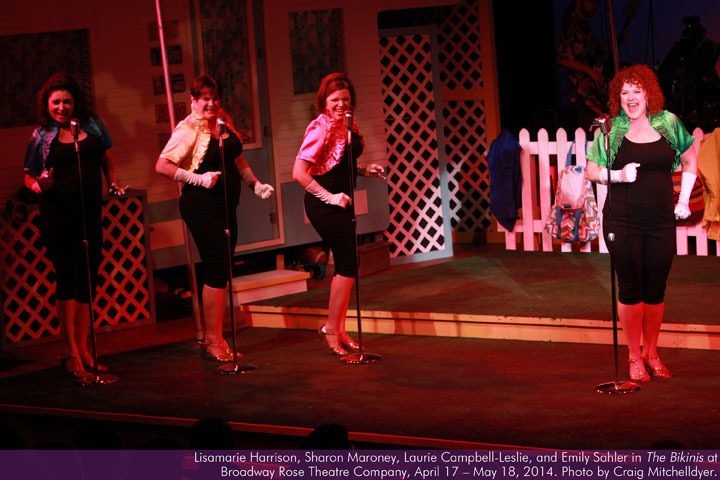 She enjoyed performing in Honky Tonk Angels as Angela, playing Muriel in Dirty Rotten Scoundrels, and Louise in Always…Patsy Cline, the first time. 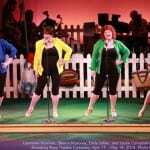 Other performing favorites include Dolly in Hello, Dolly! 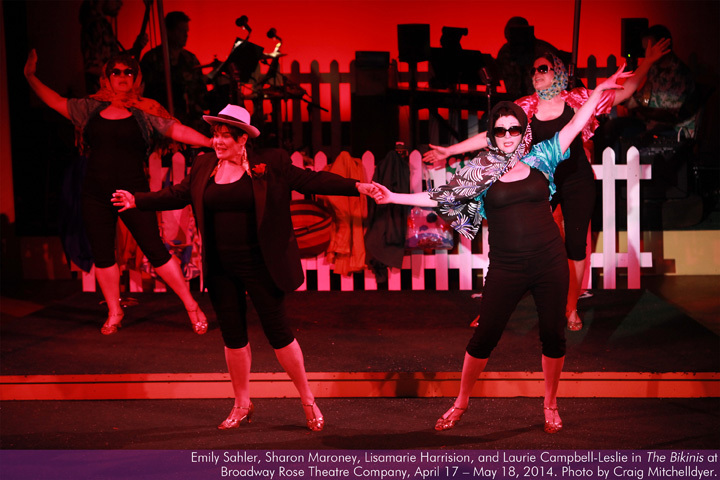 at Broadway Rose, Lakewood Theatre and Surflight Theater; and Dorothy Brock in 42nd Street. Her favorite roles include Keely in Pete ‘n’ Keely and performing in Forbidden Broadway for triangle productions! Sharon is looking forward to performing this summer as Mona in The Best Little Whorehouse in Texas alongside husband and Co-Founding General Manager Dan Murphy. 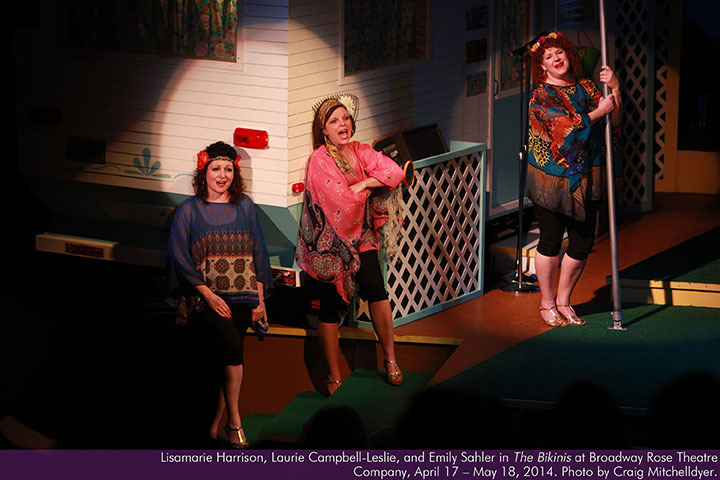 Emily Sahler (Barbara) is thrilled to be at Broadway Rose again, having played Mrs. Tottendale in The Drowsy Chaperone (Drammy, Best Production) and Bernice in Bingo. Favorite roles include Connie in Jack Goes Boating, Sister Lidwina in Gracie and the Atom and Bette in The Marriage of Bette and Boo (Artists Repertory Theatre), Rose in Gypsy, Jack’s Mother in Into the Woods, and Doreen in Tartuffe (Lakewood Theatre), the Caterpillar in Alice & Wonderland, a Rock Opera and and Ms. Frizzle in The Magic School Bus Live! 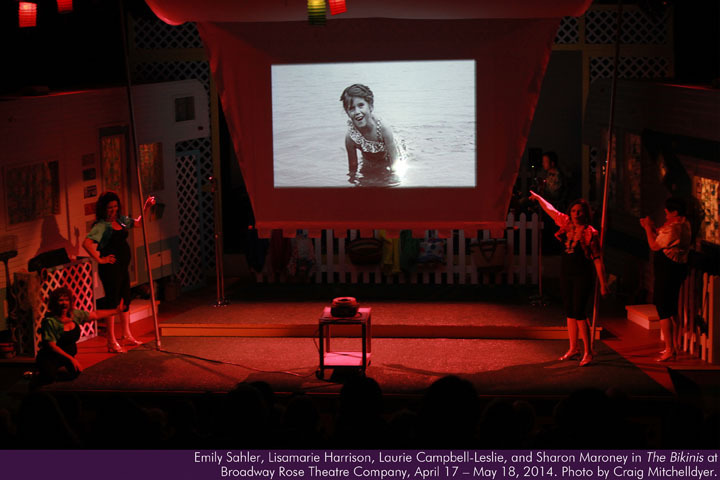 The Climate Challenge (Oregon Children’s Theatre), Dr. Charlotte in Falsettos (Live On Stage), Ninon de l’Enclos in Child of Pleasure (CoHo), Prudie Cupp in Pump Boys & Dinettes (triangle productions! ), Marie Dindon in La Cage Aux Folles (Musical Theatre Co.), Sheila in Hair and Bonnie in Anything Goes (Portland Civic Theatre). Television credits: Portlandia and Leverage. Emily directs interactive murder mysteries for Wild Bill’s. Between productions you can catch her jazz and cabaret performances at Tony Starlight’s Supperclub & Lounge. 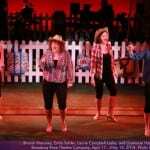 Director Jacob Toth and Musical Director Jeffrey Childs make the most of the amazing talent at their disposal, giving the audience exactly what it wants – a fun and sometimes wistful journey into a cherished past…Read more. ...The four stars turn in strong performances. 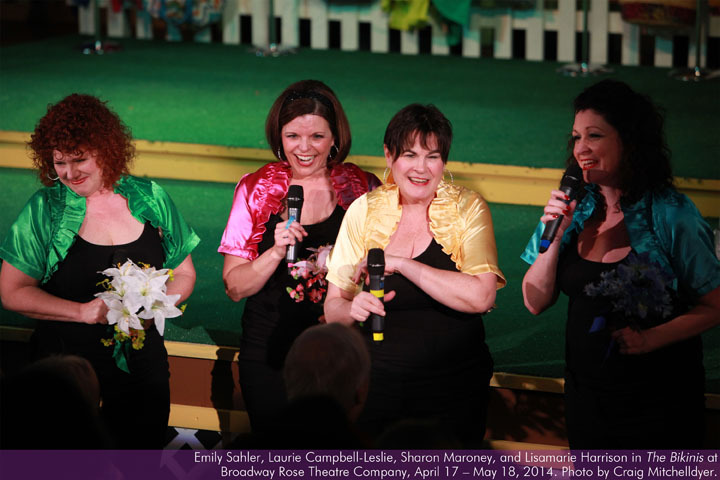 Clad not in swimsuits but in black spandex and a rotating selection of period-appropriate costumes, they bring the audience up to speed on their lives post-girl group, from the Vietnam War to the disco era, marking each period with a song…Read more. Music director Jeffrey Childs did a fantastic job coordinating the vocals and the band; musically the show is near perfect, and when the singers are allowed to just sing, they’re great. (Whoever did the vocal arrangements on Melissa Manchester’s “Midnight Blue” deserves a medal. )…Read more. 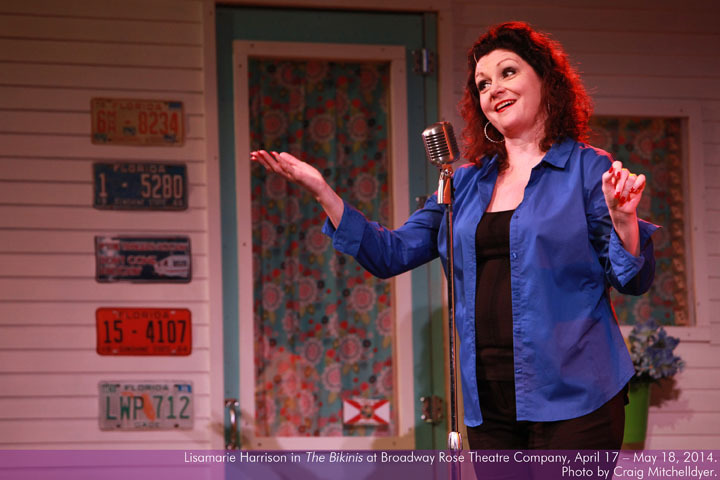 Four actresses share their lives, reveal tidbits from Broadway Rose show…Read more.